Gold’s main fundamental relationship over the past 10 years has broken down. It’s a rude awakening to gold holders. However, understanding this break in the trend is imperative for figuring out gold’s next move – up or down. Today we’ll take an in-depth look at what’s going on. Avoid this gold update at your own peril! “Most gold bugs won’t see it coming” says my colleague Greg Guenthner, editor of the aptly named Rude Awakening. Although he didn’t specifically come out and say it, I know Mr. Guenthner was referencing what I believe is the #1 fact that gold investors must know. That is, you can’t trust the most commonly-listed fundamentals for gold. Luckily we’ve got a graphic to sum up what I’m talking about. You see, the seemingly unbreakable 10-year, fundamental relationship between gold and the M2 money supply is done-for. Now that we’ve given the long-term chart some time to shake-out, it’s clear that this is a game-changer. Point being: the money supply is still rocketing higher, interest rates are abysmally low, the Fed is continuing to pile nearly $1 trillion per year into bond purchases and yet gold prices are floundering. If you didn’t pick up on this trend early in 2011 or 2012, then 2013 was a staunch reminder that the good old days of gold fundamentals are gone. 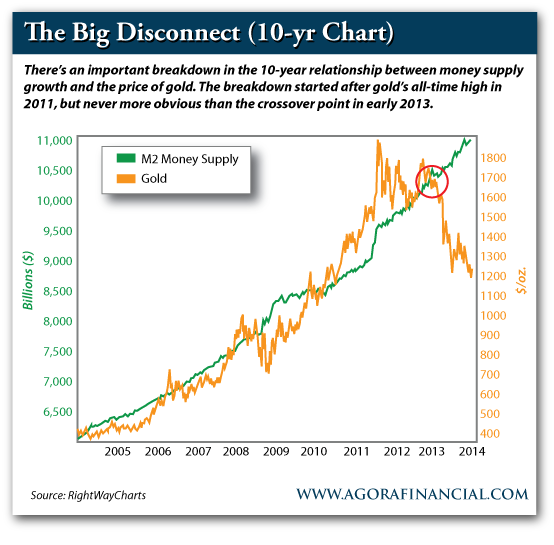 In regard to the chart above, the relationship between the money supply and gold, for now, is dead. You can’t say it any other way. That’s the great part about analyzing the charts. You don’t need to get into the nitty gritty of quantitative easing (QE)… where the money is flowing… or what the new Fed Chairman Janet Yellen is thinking. Instead you can just look at the aftermath. From the chart above you can see that there’s a clear disconnect between a gold bug’s fundamental argument and what’s really happening – a costly disconnect for traders. 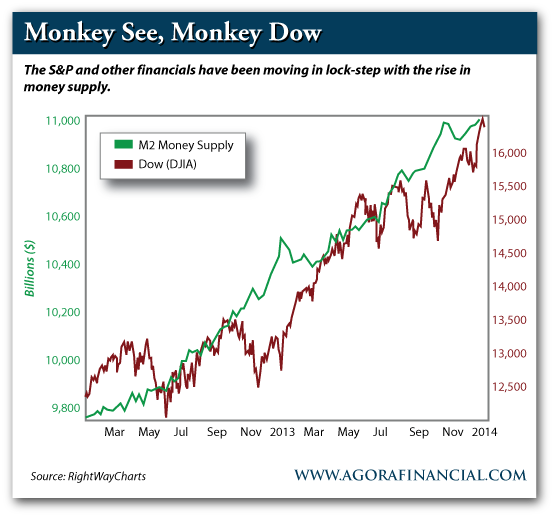 In the meantime, if you’re wondering what IS following the money supply higher, the answer is simple: stocks. Over the past 5 years The Dow, S&P and Nasdaq have continued a steady move higher. Over the past 24 months these broad-based stock barometers have moved in near lock-step fashion with the Fed’s increased balance sheet. Indeed, as the Fed continued to utilize its QE policies it was stocks, not gold, that have gained. Back to our metal discussion, gold is on its own now. On that note allow me to be clear: Just because gold decoupled from its fundamental relationship doesn’t mean it’s automatically headed lower. No, this does NOT guarantee gold’s demise. 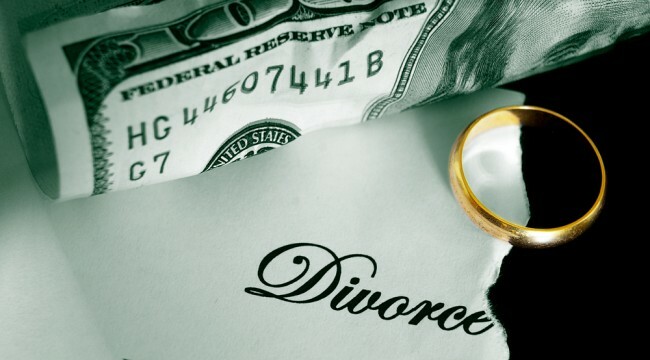 Rather, it’s an important factor you MUST consider when investing in gold or gold shares. You can’t just look at the skyrocketing money supply and assume gold is headed higher. Same goes with some of the other fundamentals we’ve followed in these pages. Sure, you can tally the physical gold buying world-over, the easy money policies in the U.S. , check your favorite “overbought/oversold” indicators or even look at the U.S. dollar index as an inverse indicator – but over the past 12-24 months none of them would have done us a lick of good. The single factor that we can count on going forward is simple price action. Until we can latch on to the next meaningful fundamental trend, we’ll have to keep a keen eye on price targets, support and resistance. The most recent level of important support is the $1,200-level. For gold to make a leap higher we’ll have to see continued support above this level. If gold breaks to the downside – no matter what happens in the fundamentals (! )—we could be in for a rocky road. To steal a term from Mr. Guenthner above, in the short-term we won’t be able to “hope” the losses away. Keep an eye on prices and beware of latching on to fundamentals – it could prove to be our best advice for the coming year. Ed. Note: What the market has in store for the gold price in 2014 is still too soon to tell. But Matt certainly offers some sage advice. And in today’s Daily Resource Hunter he offered his readers even more than that… They were treated to no less than 3 chances to discover specific, actionable investment opportunities. It’s just one perk of being a subscriber of his free Daily Resource Hunter. Not a member? Sign up for FREE, right here. Your next issue is just a few hours away.